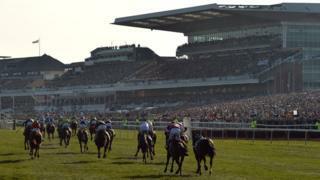 An attack on a Grand National spectator as he stood waiting for the race to start left him with a fractured eye socket, police have said. The man was attacked near the Lord Daresbury and Princess Royal stands at Aintree at about 17:10 BST on 6 April. A Merseyside Police spokesman said the racegoer was near the front rail which runs around the edge of the course. A man with blond hair who was wearing a beige jumper and a checked shirt is being sought over the attack, he added. Det Insp Gary Stratton said the attack was "disappointing" as the majority of the crowd had been "good natured". The race, held on the final day of a three-day festival, drew over 70,000 spectators to the course in Liverpool.